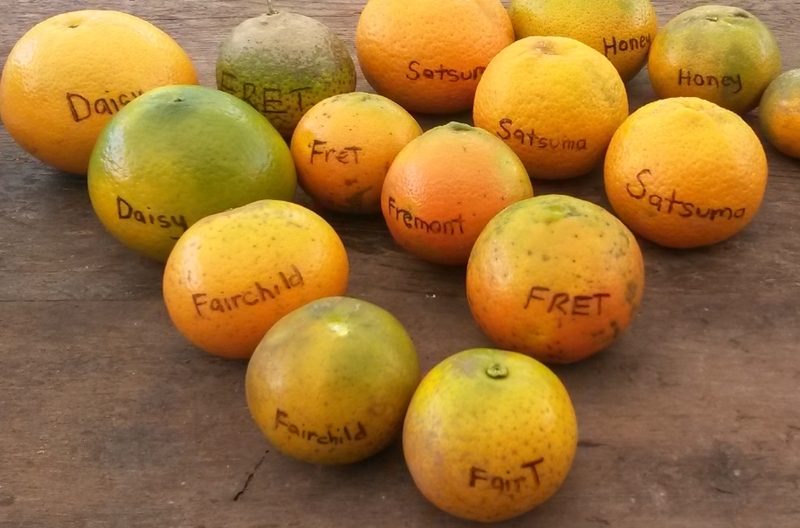 Citrus is such a vast subject that volumes have been devoted to this genus. It is rich in history, with varieties being cultivated as far back as 2000 BC in China and is now a billion dollar industry worldwide. Citrus can be grown from sea level to the upper slopes, each variety having its ideal growing area. 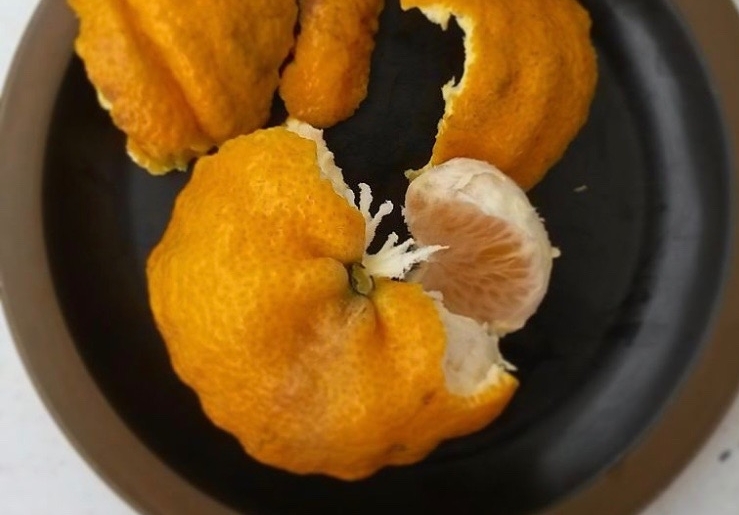 In Hawaii with our tropical climate, expect oranges and tangerines to have a greenish tint to the skin and a tighter adherence of the peel to the fruit, making oranges and other citrus more difficult to peel than citrus grown in more temperate areas such as California. Citrus must be planted in a well-drained soil and requires regular fertilization with minor nutrients for maximum production. Please see our tree care guide for growing tips and fertilizer suggestions. Washington Navel Oranges are the most widely planted and prolific oranges grown in Hawaii. The tree is medium size with a round crown of dense, dark green leaves. The fruit is large and distributed throughout the tree. The seedless fruit has a delicious, rich juicy flavor. Cara Cara Navel Oranges have a slightly pink skin that is easy to peel, and flesh ranging from rich orange to dark pink. The interior is sweet with relatively low acid content and few to no seeds. We also grow a variegated Cara Cara with the same characteristics. Fisher Navel Oranges are a California selection that bear the same high quality fruit as the ‘Washington Navel’ but ripens earlier in the Fall season. The fruit is delicious, juicy and seedless. Lane Late Navel Oranges are a bud sport from a Washington Navel tree in Australia. The fruit has the same high quality as the Washington Navel but ripens later in the season, during our Spring months. The fruit is delicious, juicy and seedless. 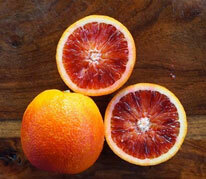 Moro Blood Oranges are the best of the pigmented oranges for our climate. The pigments of the fruit flesh is more subtle when grown in Hawaii because there is less variation between our day and night temperatures. They are a very prolific producer of juicy sweet seedless fruit. Valencia Oranges are the standard “juice” oranges, and is also delicious eaten freshly out of hand. They are also called ‘Kona Oranges’, as they were the first oranges to be planted by seed in Kona in the late 1700s. They are the most widely grown orange in the world, and are very productive. The fruit is delicious, seedless and make wonderful juice that will keep for several days. Minneola tangelos are a cross of a Dancy tangerine and Duncan grapefruit. The fabulous fruits are favorites among the Plant it Hawaii staff. The flavor is excellent, sweet-tart, aromatic and rich. It makes excellent juice, as the fruits are extremely juicy, but quite difficult to peel in our climate. The large orange fruit is ripe in the fall and winter months and tends to be a heavy and regular bearer. Is easy to peel, usually seedless, and ripens in the winter and spring months. The fruit is rich and very sweet and juicy. Tress prefers a coastal lowland climate for best fruit quality and production. It is a vigorous grower and comes into bearing early. The fruit achieves good color here. Daisy tangerines are a cross between two mandarins, Fortune and Fremont. The trees bear fruit in the winter months, and tend to produce large crops every other year. The skin is smooth and thin, and the flesh is seedless. Dancy tangerines are a popular variety and are the most widely planted tangerine in the state. The bright orange fruit is juicy and sweet and is ripe in our winter months. The canopy shaped tree is a vigorous, upright grower tending to bear heavily every other year. Trees are nearly thornless and the fruit must be picked when ripe. The fruit is easy to peel. 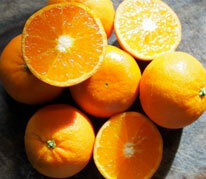 Fairchild tangerines are a cross produced from Clementines and Orlando tangelos. The trees bear fruit earlier in the Fall months, tend to produce large crops every other year, and produce more, high quality fruits when planted with other tangerine varieties. The fruit is juicy and rich, and the trees are thornless and spreading. Gold Nugget tangerines are late season producers, and are usually harvested in the Spring months. The fruits are medium sized with a somewhat lumpy, thin skin with great rich flavor and no seeds. The trees grow upright and benefit from regular pruning to encourage a round canopy. Honey tangerines have a sweet, delicious, somewhat spicy flavor and are very juicy. The fruits have few seeds and the fruit holds on the tree very well when fully ripe. The trees are vigorous, upright and productive growers with the fruit being held on the outermost ends of the branches. The fruit is medium sized and can be small if there is a heavy crop. The fruit is generally ripe in mid-winter through spring, although it is known to bear fruit most of the year in many Hawaii locations. 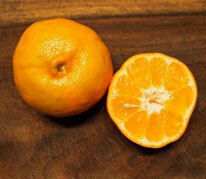 Satsuma tangerines are a seedless variety that is more cold hardy than other varieties. The reddish-orange fruit is medium sized and somewhat flattened at the stem end, and extremely easy to peel. The sweet, juicy fruits are usually ripe in the winter months. It is a small spreading tree with an open canopy and dark green foliage that loves the higher elevations in Hawaii, but does equally well in the windward lowlands. Calamondins are a hybrid of a lime and a kumquat. The tree is small, upright and bushy with many attractive, bright orange small fruits all through the year. The flesh is orange, tart and very juicy. It can be used just as you would use any lime, for garnish, zest or juice, and has a distinct delicious flavor. The tree is easy to prune to keep as a bush and can be containerized for many years in a large pot on the lanai. It is enjoyed for its fragrant blossoms and fruit that cover the tree several times a year. We also grow a variegated Calamondin with the same characteristics. Finger limes are originally from Australia. The fruits are small and long, roughly resembling a finger. The skin is thin and the pulp is made up of small, round beads of tart juice. It has been referred to as the caviar of citrus and is a sought after culinary fruit. The trees are small, with fragrant flowers and numerous thorns and produce copious amounts of fruit throughout the year. Kaffir limes are mainly grown for their aromatic leaves which are used in Thai and other Asian dishes such as soups, stews and curries. Kaffir trees are small with compound leaves. The new growth flushes are purple and soft which then mature into glossy, firm, dark green leaves. Kaffir lime makes an excellent patio plant, beautiful with fragrant flowers. Kaffir produces a small, bumpy, wrinkled and seedy fruit with a thick rind that contains pungent oil. The rind can be grated and used with the leaves in cooking. 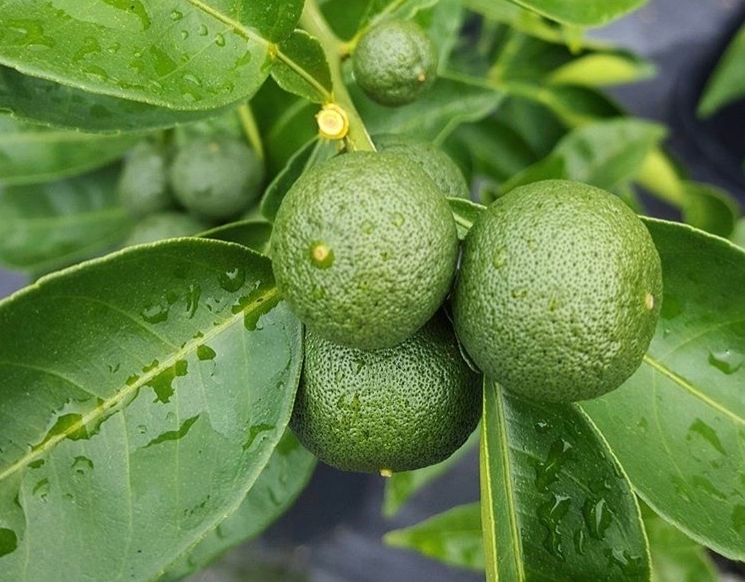 ‘Tahitian Lime’, also known as ‘Bearss Lime’ is a medium sized, vigorous tree that bears fruit about ten months of the year. The fruit is seedless, juicy and the trees are prolific, dependable bearers. The skin of the fully ripe fruit will turn slightly yellow, but the juicy flesh inside is pale green, and has a true acid lime flavor. The consistent fruiting, dark green leaves and almost constant flowering make the Tahitian lime an excellent orchard tree or container plant for the lanai. Eureka lemons are one of the most widely planted lemons in the world. The seedless fruit is borne in clusters at the ends of the branches. The rind is thin, smooth (has the look of the ‘Sunkist’ lemon) and is rich in aromatic oils. Fruit quality is excellent, juicy and acidic and the skin is used as ‘zest’ in cooking. It is moderately vigorous and grows into a spreading tree, preferring the sunny lowlands, but can be grown successfully in upland Hawaii. The tree has a long fruiting season. Meyer lemons are popular for having a unique mild, juicy flavor and almost year round fruit production. The small spreading trees have almost constant flowers and fruit, making it an excellent dooryard tree or potted fruiting tree for a sunny lanai. The Meyer Lemon is very adaptable and can be grown in nearly every location in Hawaii. Fruits are large and round with smooth thin skin. It is such a heavy producer that tree does not grow large. Variegated Pink Eureka lemons are sometimes sold under the name ‘Pink Lemonade’ and are a bud sport of the conventional Eureka lemon. The leaves are an attractive creamy-white and green variegation with a pinkish tinge on the new growth, making the tree beautifully ornamental. The rind is striped green and cream which yellow as it ripens. The flesh is light pink at full maturity, seedless, acidic, and juicy. Trees produce an abundance of lemons year-round. Sudachi, a Japanese citrus, is a hybrid of a mandarin and papeda, a citrus relative. The fruit has a distinct acidic flavor and is used in savory dishes as well as beverages and vinegars. The small fruits are usually ripe in the fall months. Trees are small and spreading with short thorns. The fruit is seedless and can be harvested while the skin is green. Yuzu is a hybrid papeda-citron citrus with uses ranging from culinary to medicinal. Both the skin and juice are widely used in Japanese and Korean cooking. The trees have a long fruiting season and can be harvested green in the summer or when the skin turns yellow in the fall. The pungent fruits have a distinct and delicious flavor and triple the amount of vitamin C as a traditional lemon. Buddha's hands are the most unusual looking citrus, as the fruit is indented down the length into several sections, closely resembling fingers. It is very popular in China and Japan, mainly used for religious ceremonies. It is also used in candies, fruit cakes, and as an air freshener. It makes an attractive container plant, offering fragrant flowers and unusual and exotic fruit throughout the year. The trees are vigorous growers and require pruning to keep in a pot as a lanai plant. Ben Hu Pomelos are a Hilo selection from Dr. Ben Hu, formerly of the U.S.D.A. It is are a sweet, white fleshed variety that grows well in the wet, overcast weather common in the Hilo area. The trees also grow well on the leeward sides, with best fruit quality grown below 1,000 feet. Chandler Pomelos are a hybrid selection released in 1961 with a sweet, pleasant flavor. The skin is yellow with a slight blush. The flesh is pink or red, and sweet. The fruits are ripe in the winter months and produce best in the sunny lowlands. Tahitian Pommelmousse is a wonderfully juicy, sweet, and tender fleshed pomelo with greenish-white flesh and skin. The fruits are large with slightly flattened sides and grow best in the dry, hot and sunny lowlands of Hawaii. Flame grapefruits are reliable, heavy producers of high quality pink blushed fruit. The flesh is juicy, seedless, and delicious. The trees produce best in the hotter lowlands of Hawaii and grow into a large, spreading trees with abundant fruit. Oro Blanco grapefruits are a California cross between a grapefruit and a pomelo. The flavor is almost as sweet as a navel orange, but with a rich grapefruit flavor. The fruit is a seedless, juicy, and tender. Oro Blanco does well in most Hawaii gardens and is the first variety to ripen in the winter months. Is the best all around pink grapefruit for Hawaii. The fruit is seedless, thin skinned, and delicious with no bitter aftertaste. The color is excellent and the high quality fruit lives up to its name. The trees will grow into a large, dark green canopy, so it is best to prune the tree regularly for ease of harvest. Meiwa kumquats are small, sweet round orange fruit. The fruit is eaten fresh with the sweet skin on . The trees are small and grow upright and bushy, making them ideal container plants. The prized fruit is ripe throughout the year, and is great candied, made into marmalade or used in savory cooking. Nagami kumquats are small acidic oval shaped fruits. The skin is more tart than the Meiwa, so the fruits are commonly used for cooking and makes a marvelous marmalade. The tree bears the abundant orange fruits throughout the year. Even when the tree isn’t in full bloom, it still smells incredible. If you keep it potted on your lanai, the tree can fill the area with sweet fragrances.